Julian Arcas is without doubt one of the best guitarists of his time. The link that was between Sor-Aguado to Tárrega was represented by this outstanding artist who reached the highest international recognition through musical authorities and critics of his time. It is essential to know the figure of Julian Arcas and his guitar works. His compositions for the instrument cover different styles of the time, ranging from the popular to the syntonic, for a total of 52 works, according to this research, of which the title and the author, 44 are original and 8 are arranged . These arrangements and themes masterfully develops Arcas, are typical of a time when the Italian influence was prevalent throughout Europe. Moreover, Arcas uses Spanish regional issues for the inspiration of his works on guitar acquire more original style representative of Spanish music. 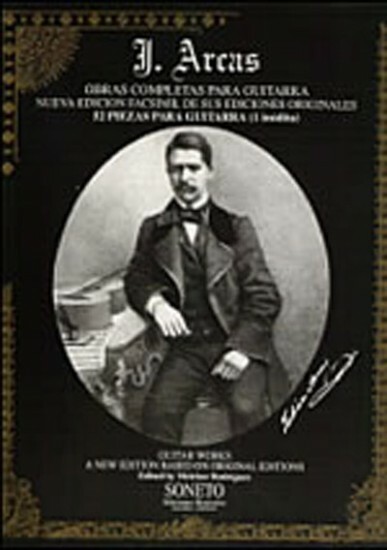 The present publication are facsimiles of the original editions of 1860 and are unpublished manuscripts of his student F. Tarrega.